I was looking for a new tasty and low-carb-friendly recipe and found that this is the best and simplest way to make roll-ups. Bacon chicken roll-ups make an impression on a special occasion on your lunch or dinner table, and your guests will love it. You can serve the roll-ups with seasonal vegetables for a healthy and balanced dinner. And Dijon mustard and cumin make chicken especially flavorful. Everyone who tastes my roll-ups wants more! They are delicious and tender. The best part is that you just can't go wrong with this simple-to-follow low carb recipe. Combine Dijon mustard, olive oil, and cumin and stir to mix well. Rinse chicken breasts and flatten until about 1/4 inch thick. Spread the oil and Dijon mustard mixture evenly on all chicken breasts and wrap 1 strip around each. You can use toothpicks to make it hold together. Season with salt and freshly ground black pepper to taste. 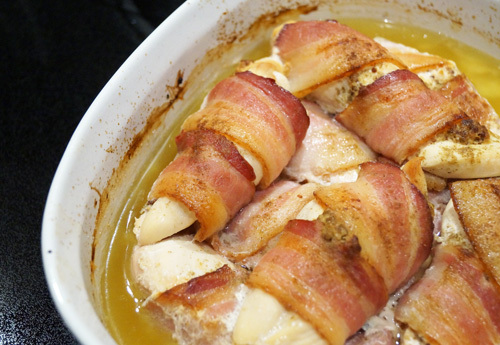 Preheat oven to 350 F and arrange the bacon chicken roll-ups in a greased baking dish. Place the chicken breasts side by side. Add water and bake for about 1 hour or until cooked. You can also use a thermometer - cook. Cook until the bacon strips are brown. Remove the toothpicks and serve.